I really love all the stamping decals I've been seeing these days. It was only a matter of time before I tried it out myself so here I am. I'm not really great at stamping yet so this is an awesome way to get unlimited tries without the fear of messing up the base color. I followed this tutorial because it shows how to create multiple decals on a sheet at one time vs making the decal directly on the stamper. This appealed to me more since I only have one stamper but wanted to make decals for more than one nail. It looks like the tutorial used a plastic baggie, but I used waxed paper and it turned out fine. I tried out a non fast dry top coat first but it stayed sticky forever and wouldn't peel off the sheet. I found that a fast dry top coat works much better so I ended up using Sally Hansen Insta-Dri. I painted little rectangles of top coat onto my waxed paper and waited for it to dry. Next I used Bundle Monster plate BM-206 with Wet n Wild, Black Creme for the stamp. I used a tiny paint brush and LA Colors, Hottie (neon coral), Island Girl, Aloha Paradise (teal), and Nina Ultra Pro, Ink-Ling (dark grey) to fill in the circles. For the fingers with the decals I used Sally Hansen Complete Salon Manicure in Ion as the base. Once all the circles were dry I covered it with another layer of top coat, waited for that to dry and peeled it off the sheet. 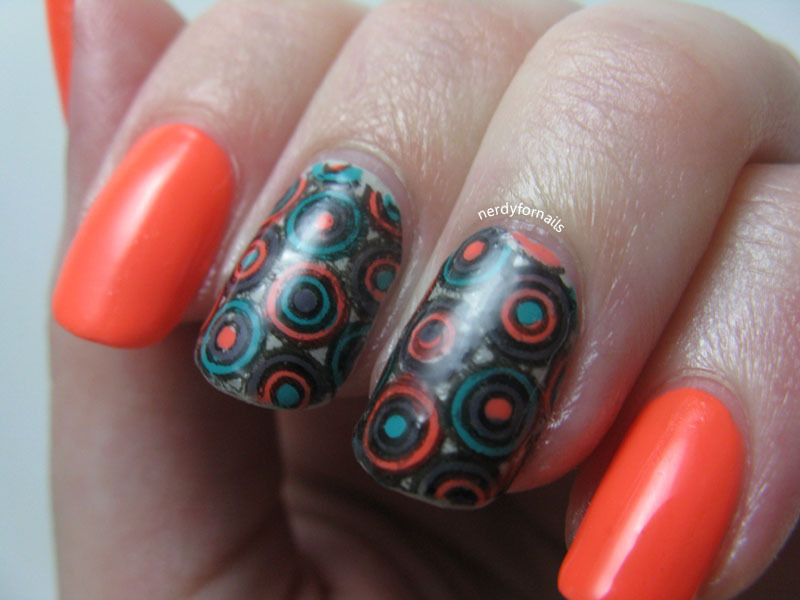 I stuck the rectangles on the slightly tacky polish and trimmed around the edges with cuticle scissors. Lastly, I used a paint brush dipped in acetone to clean up the edges and help the polish melt into the base coat and adhere a bit better and finished it off with more top coat. It seems like a lot of layers, but the decal fit smoothly to the nail and didn't feel thick or bulky. It was actually a lot easier to apply than some nail decals I've tried. If I hadn't picked such a time consuming stamp to fill in I'd even say this is a pretty fast way to get a fancy looking manicure. 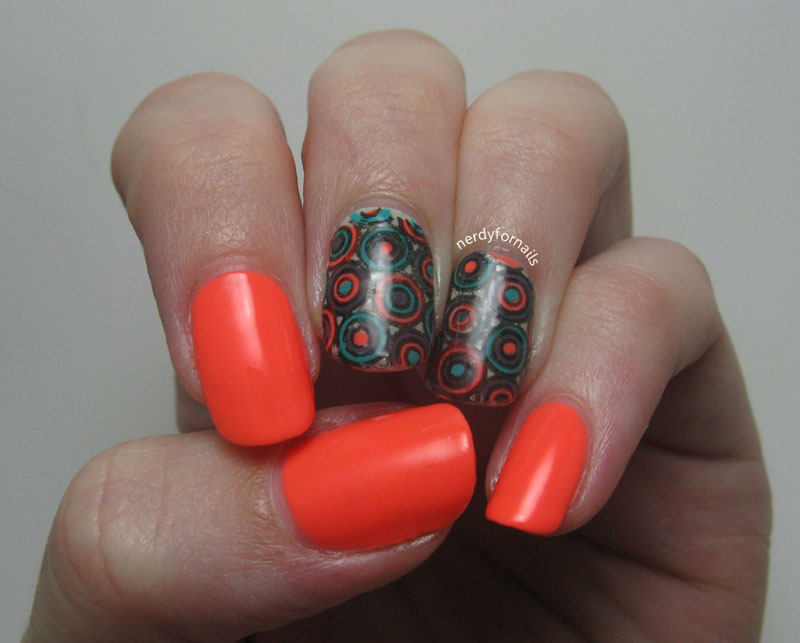 This is an amazing mani! Great job. Thanks for the great tutorial! I love these colors together too.